The Sunday Paper isn’t showing up every week, but Jesse seems to single-handedly keeps it alive by sending his articles into UofMUSCLE@gmail.com. Plus he follows the guidelines which kept things easy for me too. Thanks Jesse! Remember the Sunday Paper is open to anybody. If you have a M.U.S.C.L.E. topic/question/rant that you want the world to see, then please feel free to send it in. 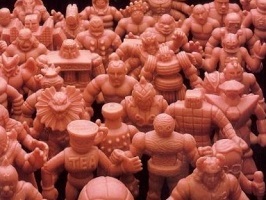 I know M.U.S.C.L.E. collectors would love an extra day of content. I’m sitting at the airport as I write this, and while I would normally be worrying about work, I find myself suddenly thinking about the price of MUSCLE. And not because I actually spend all that much time considering the price of MUSCLE, but because I just paid $9 for a drink. And not the alcoholic kind, but a stupid bottle of kombucha. Now I don’t really like the kombucha, so don’t ask why I am drinking it. That’s not important. What is important is I just stood in line for ten minutes to pay $9 for a bottle of kombucha. When the cashier rang it up and told me the price I almost walked away. But alas I handed over my Visa Debit and coughed up the $9. As I walked back towards my gate the first thought that popped into my head was I would rather have bought this. I have been watching this auction for a while and honestly I have been close to buying it. Is the price good? Not really – although these things have been selling this high for a while so I am sure many would disagree. But the real question is, is the price better than the $9 I just threw away on a bottle of kombucha? Absolutely. So why did I not hesitate to buy that damn drink but I won’t buy these figures? Which I get to keep forever and not just until I take my next piss. Which, if I chose, I could likely resell down the road and get a few bucks back on. The answer is I don’t know. The fact of the matter is, I generally have no problem paying $5-10 for a drink but I die a little each time I spend more than $1 on a MUSCLE. I have bought $9 beers with some regularity over the past decade, I pay $5 at least once a week for overpriced coffee in some sort. Hell, last week I ate at some hole in the wall and got charged twice for the same $3 soda on my tab, and I didn’t say a thing – decided it just wasn’t worth the hassle. This isn’t meant to be a beverage-centric comparison, it just easily illustrated my point. I could come up with a bunch of other frivolous things I blow Hamilton’s while internally debating whether or not I should place a $25 bid on a 35 MUSCLE auction, since its outside of my 70 cent sweet spot. So this brings me to my ultimate question: why are the prices of MUSCLE on the rise? Is it the sellers? This is certainly plausible given the number of sharks patrolling the water on eBay these days. Is it an increase in demand? Others have pointed out that with new lines like the MOTU MUSCLE, maybe people have just had their desires rekindled. Is it inflation? God knows everything else in the world is rocketing in price for no real reason, so why not MUSCLE. If you’re feeling inspired, then please sent in your article and pictures to UofMUSCLE@gmail.com. This entry was posted on Sunday, September 3rd, 2017 and is filed under UofM News. You can follow any responses to this entry through RSS 2.0. You can skip to the end and leave a response. Pinging is currently not allowed.